Imran makes six pledge­s at the rally. Manife­sto not read out. 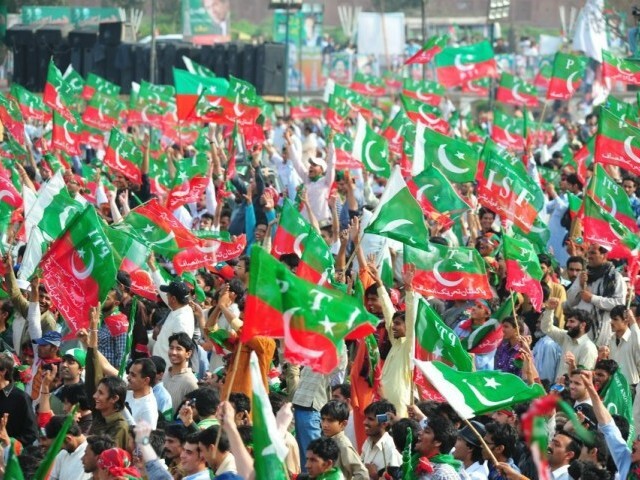 LAHORE: Pakistan Tehreek-e-Insaf (PTI) organised a massive rally at the Minar-i-Pakistan on Saturday, reported Express News. PTI chief Imran Khan, addressing the rally, made six promises to the people that he will not lie, will not indulge in double speak, take benefit of his position if elected into power and will not take his money out of Pakistan. Imran said that his party did not need to make alliances. He added that change was not coming, but has arrived. He promised to tear down the walls of the governor house and build sports grounds there and convert the governor house into a library if the PTI wins the elections. While Imran announced that PTI’s manifesto would be read out, heavy rain and technical difficulties prevented that. In preparation for the expected strength of attendance, security arrangements have been beefed up in Lahore, including deployment of 2000 police officials and bomb squad security checks. The organising committee rented 50,000 chairs for the rally and up to 3000 youths volunteered to help usher people to designated areas in the rally. The speeches are currently paused due to heavy rain and a stampede at the rally. 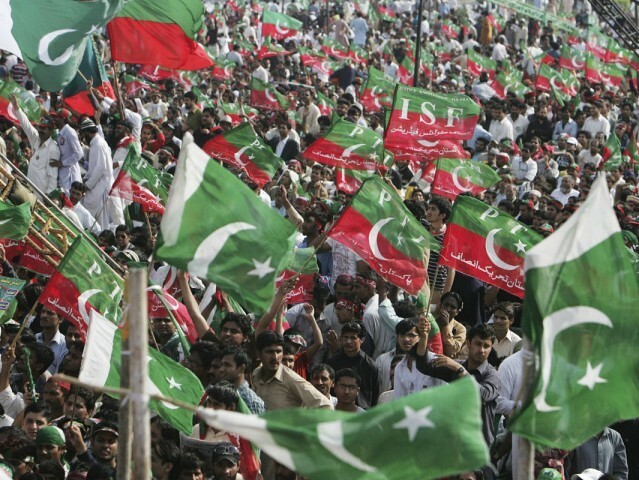 Express News reports that there has been a stampede at the PTI rally. Initial reports say many people have been injured due to the stampede. “I want to thank you all that you have proved that change is not coming, but has already arrived,” says Imran Khan. My father stood in this very ground in 1040 when the resolution for Pakistan was approved. They told me that he was here when the decision for Pakistan being made he was there. All of you, you can tell your children that when the decision for the new Pakistan was being made, you were all here. It is raining at the rally grounds in Lahore. 1. I will always speak the truth to the people of Pakistan. 2. The PTI government that will come into power, I promise that we will try to end tyranny. 3. I will never take my money out of Pakistan. 4. I will never take personal benefit from being in government, nor will my relatives be allowed to benefit from my being in power. 5. I will protect your tax money. 6. We will stand together with every Pakistani in or outside Pakistan. PTI chief Imran Khan says that his party’s manifesto will be unveiled soon. PTI chief Imran Khan says that he will be making six promises to the people. PTI Chief Imran Khan addressing the rally at Minar-e-Pakistan ground. “After PTI was created, the party lost the first elections. People started taunting Imran Khan that ‘politics is not a game, you cannot do it’. He said ‘I will fight’. In next elections, Imran Khan won only one seat from Mianwali, people said ‘Forget it, it’s not possible’. Imran Khan said: ‘To make impossible possible is Imran Khan’,” says Shah Mehmood Qureshi. Shah Mehmood Qureshi addresses the rally. The address will resume after Maghrib prayers. Minar-e-Pakistan ground full of people. 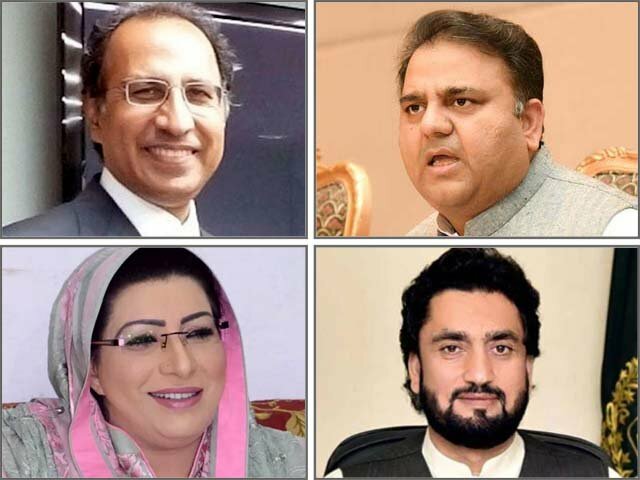 80,000 leaders of PTI, who won the intra-party elections, will take oath later today and Imran Khan is expected to administer the oath. The Express Tribune reporter Rameez Khan reports that a large number of females have arrived at the venue to attend the procession. However, families express concerns over the arrangements as no segregated sitting area was created for the female participants. Imran Khan reaches the Minar-e-Pakistan ground. People get excited to see Imran Khan. Rain has stopped at the venue. More people are coming in despite delays due to containers, making the crowd stronger in numbers. 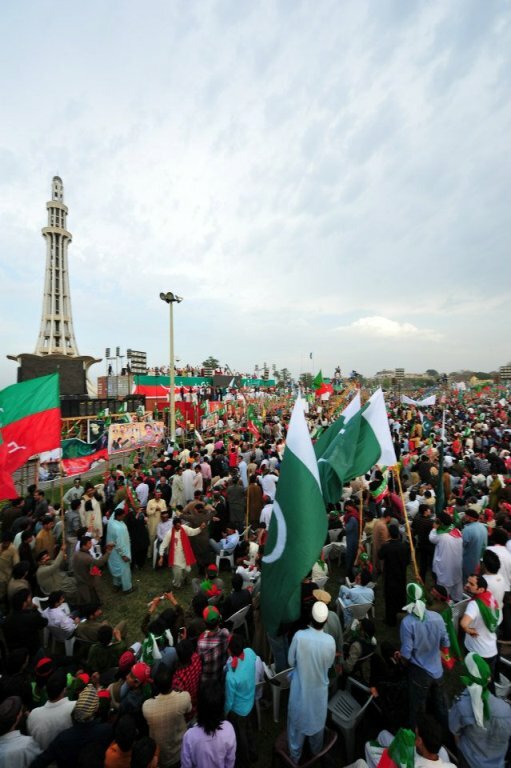 PTI claims 1 million people will be in attendance, however the venue is not yet full. Families, women and children are visible in the crowd. Recently elected president of the PTI Minorities Wing, Sajid Ishaq is addressing the crowd. Recently elected president of the PTI Women Wing, Munazza Hasan is addressing the crowd. 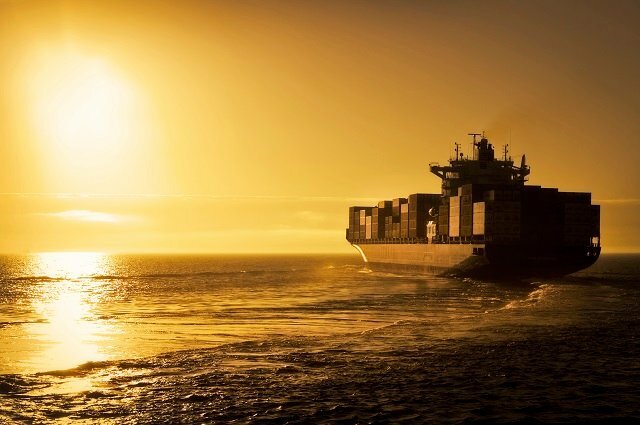 Apart from the containers blocking passages, there are hurdles to face. It has started to rain, though the weather was clear earlier. PTI complains that containers put by the police to block routes is causing difficulty and delay for incoming supporters. Police say it is a part of their security procedures. Supporters are singing and dancing to national songs while they wait for Imran Khan to address the crowd. Imran Khan is said to begin his address around 6- 6:30pm, Express News reports. Police argue that the bus service should be closed based on earlier untoward incidents. Inshallah, Pti will be our new government. As per the PTI’s promise they will release the “Manifesto for the change” on March 23. Desperately waiting to see it as this manifesto will judge PTI’s as well as Pakistan’s future. IK is the future of pakistan, a true visionary who can bring change in 90 days. Good to hear that, there will be at least 50,000 chairs available to awam before and after the rally. Pakistani politics is not “manifesto oriented” but “name oriented” which is a reason for the party promoting Imran Khan’s name; so no “change” but “traditional politics”. Punjabi Taliban Ittehad (PTI) is backed by establishment and will never serve Pakistan. Wish I could be there….! Best wishes and good luck to IK and Pakistan. Allah has given us Imran Khan as a symbol of hope!! Go Khan Go!! We are with you!! Waiting for the Manifesto for the change!! Hope this Jalsa will be the last nail in coffin for corrupt politics in Pakistan!! Imran khan re surging some emotions on this historic day ……I Feel PUMPED !!!! Well I am not impressed at all that One Political Party used One National Holiday for their Own Political Mileage. The government must ban all Political gatherings on all National holidays. On 23rd March many families in Lahore visit Minaar e Pakistan and all are now in their homes and also due to this rally our holiday is being ruined as many families opted to live in their homes rather than going out owing to the flow of people and chocking of all roads. @shaami: Or hold this rally on a working day and close down everything? Out of ten participants, only one is a genuine voter. They will get about 5 seats in NA and around 10 in Punjab PA.
@Shaami: so according to you, families who wanted to visit minar-e-pakistan and had to stay home because of the jalse had more of a right to visit the place than the thousands of people who are already there? Arent we supposed to have equal rights? dont see much logic in your argument. @shami, it’s not about holding this gathering on national holiday. At least they are not blocking roads or causing chaos in city. It’s freedom of act and speech, anyone should be allowed to hold gathering as long as its peaceful. As far as families who wanted to have picnic there, won’t hurt if they don’t go there one day. There are plenty of parks available after all Lahore is city of gardens! @SNaqvi Well first of all I am stating my opinion and you can disagree with me. All I am saying that there are ordinary weekends for rallies but on National Holidays atleast Political parties should avoid any Rallies. My point is that on National Holidays we should think above of Our Political and Ethnic Biases and then we could progress only. Right now thousands who are at that place are representing one Party only but my contention is that on National Holidays we should contemplate what went wrong in the past and how to progress as a Cohesive unit without any Bias of Politics, race, religion or creed plaguing our Society right now. Every Sunni will vote for Imran Khan and the PTI. He`s a true Islamist and Muslim. IK is last hope in the darkness of pakistani politics. Where does PPP get its funding from? This kind of show will cost billions of rupees. @Zahir Cheema: Punjab has been sidelined from the central rule since Musharraf took over in 1999 and last 5 years have been very heavy on Punjabis when they found Non-Punjabi Pakistan ruling in Pakistan. Imran Khan has been placed to reclaim what Punjabis think as their birth right to rule Pakistan. We Non_Punjabis patriotic Pakistanis know Imran’s reality hence not impressed by desperate efforts of Punjabis to fool other Pakistanis to follow their leader. We have already seen true color of Imran’s leadershio when he was PAkistan’s captain and how did he scuttle the careers of many Non-Punjabis players. Oh please say in no uncertain terms that you will always protect and honor the hapless minorities of Pakistan. Otherwise, all these promises seem very hollow. 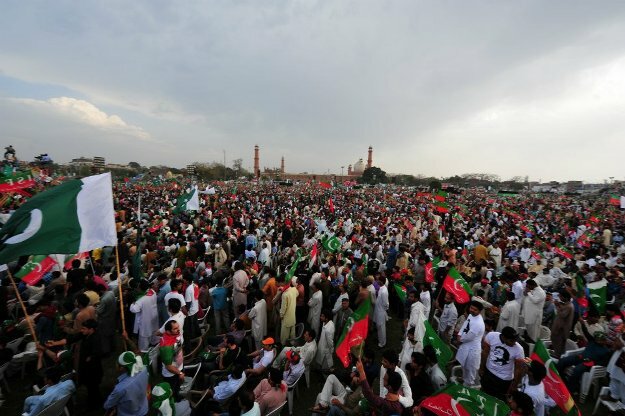 There almost One Lakh People at Minar i Pakistan Ground at evening. Is it Tsunamaaaaa? 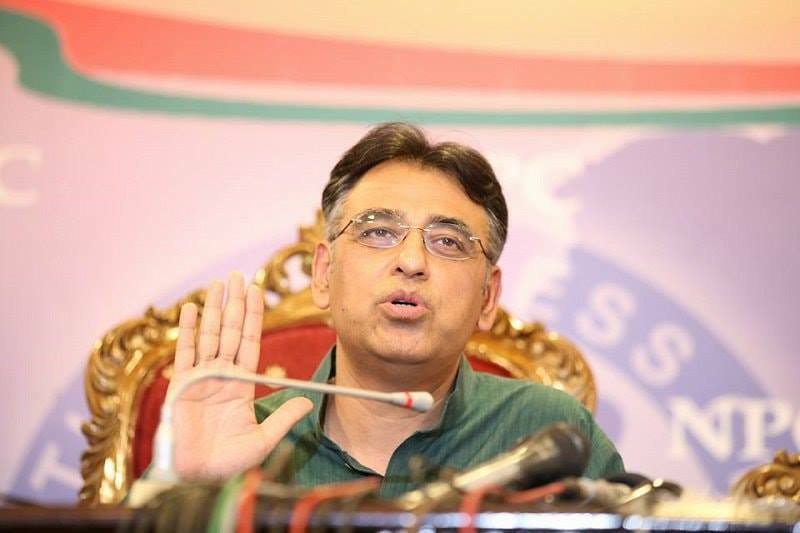 “I will not do the drama of new provinces, or increase wages of labourers.” First assurance to Punjabis that he will safeguard Punjabis vested interest by keeping Seraiki land under the rule of Lahore. @Nitish: Do you have any concept of political fund raising? PTI has a very extensive network of members inside and outside Pakistan who support it financially (me being one of them for example). I know of students abroad who hardly have any income but cut their expenditure to support PTI. Why so much commitment? You have to understand that most of us believe that Pakistan is going through the most critical phase of its life and coming elections will make it or break it. No offense. This is precisely the super de-politicization logic that has been handed by our elders that has gotten us in this mess. If there is any speculation that needs to happen on this day, then that would be how do we start owning the political buck and knowing the issues of our country. IK’s appearance on the political horizon has done this very thing, it has charged up the very youth who are the future of this nation and were thinking about leaving the country at the first possible opportunity. At least we see some level of patriotic resurgence and growing familiarity with country’s true challenges in the nation because of IK’s efforts. The very fact that a chunk of our nation has gathered regardless of the fears of security on a platform is is itself respectable. Pakistan = Not places & holidays, Pakistan = 180 million people like us! Can anyone guess the count, currently ?? TSSSSSSUNAMI is here. Where is Pti, running! @Asad: @Nitish: Do you have any concept of political fund raising? Yes i have.There was a time when Laloo prasad yadav used to conduct rallies quite frequently in bihar.Daily bandh and protests were the usual scenario…result?state was almost on the verge of collapse. Why i raised this question?PTI is not in power anywhere in pakistan by now.Hence he would not be able to use public funds by any means(corruption or whatever).Then question becomes obvious in his case….In india ,arvind kejriwal is always questioned by authorities for running political party.later,it was found that he has backing from private organisations and NRIs…..
Imran Khan’s Tsunami Defeated, Allah’s Rain Wins. Imran Khan PTI did not complete his speech and nor present manifesto. 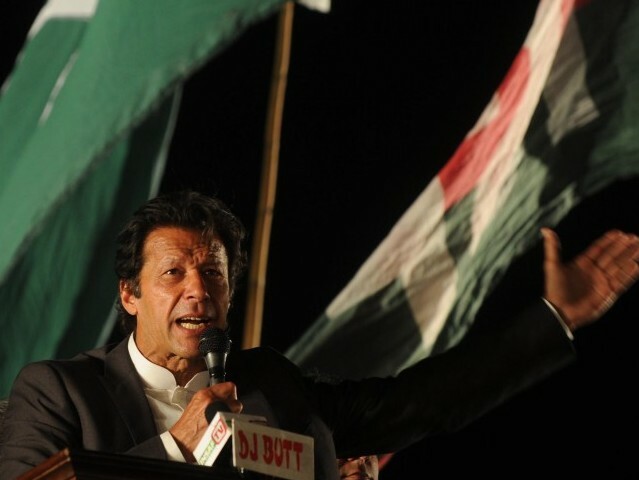 He and his supporter ran…………..
‘A leader is someone who knows his limitations…’ Well done Mr. Khan…! I could sense the sincerity, compassion and enthusiasm out of your words… True Pakistanis are with you..! what’s the point even asking for a comment? People want leaders to be honest but everyone needs to be truthful and honest themselves too if they really want to live a peaceful life. Most of us think that following the religious rituals makes us better than everyone else. What’s the point of performing rituals if we don’t speak the truth and be honest with ourselves. despite of thunder storm we didnt move till IK finished his speech, its just beginning of Naya Pakistan, Thank you Lahore for your support. Well Imran Khan supports those who attack secular parties of Pakistan hence they need to protect themselves. Show failed..those who were threatening with Tsunami, started running after few drops of rain. Complete waste of time and money. Election boycott is the only option for Imran Khan. Imran Khan is not taking Pakistan into future; he wants to take back Pakistan to the of Zia ul Haq rule. He gets JI supprt, as Zia got. He supports militants. As Zia did.He gets supports from anti-PPP nationalists in SIndh as Zia got. This is the kind of mentality we need to wipe out. Don’t bring ethnicity into this pls. @Nitish: no one is interested to hear what you or your laloo is upto go and troll somewhere else. I know you personally, If you haven’t noticed some body keeping an eye on you from Finland. Get lost with travel agency. How about your muk muka with PML-N, people like you can be jealous only..
At least for educated mind he is doing enough to gather us all for one good faithful cause. Good to know so many people turned up for IK rally. Hope the change he is talking about will come sooner rather than later. On the lighter side, considering the history of Pakistan and elections of 1970, it would have been better for IK to not use 6-Points. We knew what happened to the country and the people after the infamous 6-Points agenda!!!!! Perversely , he’ll only pop , if anything . He’ll just win 5 seats in NA but will try to divide league votes to help Zardari . Has Malala Yousafzai landed in Pakistan? vote for change. IK is doing his best. now its our turn. Seeing the bold political reformation efforts by Imran and the political movement that is growing especially among the youth is heartening and even inspiring, wants me to move back there. I hope people will unite (even with “agree to disagree” on political direction of the nation) and support political reform and continuous democratic process in Pakistan to allow cleansing of system. We need more self-made, honest political leaders and none of professional polticians who inherit seats by virtue of birth or being lackeys of foreign masters. Imran is unpolished as a politician but an honest patriot and a good leader. God bless Pakistan and all its people. Well done Imran Khan on a gathering of about 1,00,000 people, now it’s time to continue this mementum to the elections, and for those so called “PTI Bashers”, have this: did PML-N ever produce a rally of this size and stature in past 5 Years, simple answer, no, PML-N nd PPPP jalsas are all rent a crowd ( anyone remember the crowd PPP rented for Benazir Bhutto’s martyrdom anniversary, it was just pathetic, its like they gave 300rs to some people sitting in the streets and told them to just wave flags!!! ), IK has truely commited party members and the country as well, inshallah he will get a fair number of seats( very optimistic for sweep). It was a failed show by PTI. Elections cannot be won by just collecting few thousands people from all over Pakistan. My vote for Nawaz Sharif. My father stood in this very ground in 1040 when the resolution for Pakistan was approved. ????? Well one has to yet to see how much this popular support gets translated in elections. But no doubt PTI has done a dent to existing exhausted parties. “There’s a storm coming, Mr. Shareef and Zardari. You and your friends better batten down the hatches, because when it hits, you’re all gonna wonder how you ever thought you could live so large and leave so little for the rest of us.” – Goosebumps when people all around started chanting in the wind and rain during the Jalsa. Tsunami khan gets thrashed and whipped by little ol’ lahori rain. Im sure looking to blame shareefs for the weather too now. ALLAH bless Pakistan. ALLAH bless PML-N. ALLAH bless Nawaz Sharif. Only hope is PML-N. Voting for PTI means voting for PPP. I do not want to help Zardari by voting for PTI. Why ET is not uploading comments against PTI. It is biased journalism by ET. What a shame was this PTI jalsa. Millions lost – could have been spent on some productive thing. All my prayers and best wishes for PML(N). Nawaz Sharif is the only hope for Pakistan. Allah bless him with health, success and long life. Aameen. I shall vote for PML-N alongwith all workers working in the factory with me. Allah will give success to Nawaz Sharif. I shall never help PPP by voting for PTI. I request PTI fans to open their eyes. The statements made by a lot of people against PTI just shows that they r willing to spend or waste their time listening to Imran Khan. Subconsciously,they r addicted to Imran Khan. He has slowly creeped in their brains and no matter how hard they try, they cant Ignore him.I do not support Nawaz Shareef or Zardari or Altaf Hussain. I do not spend a second watching their jalsas because I know that there words hold no importance to me! Take the example of the TV channels, whenever Imran Khans is being interviewed on a tv channel, the number of Ads increase. Do you know why!? Because people want to watch him! Plain and simple! Can’t ignore him Boss!!! Politicians of all colours have so far failed to deliver. Loot and plunder have been their sole mission. Imran Khan is the only politician who has not been tested. He is educated and has a clean record. He is the only hope for the survival of Pakistan. What a fabulous display of passion it was.. Imran khan stood firm in heavy rain without even carrying an umbrella. I salute the brave crowd for standing firm with Imran khan in such terrible weather conditions.. Inshallah, PTI under the leadership of Imran will lead us in near future. I didnt ask you to respond me back..got it. A. That this time around PTI will actually do the democratic thing and contest elections. B. Malala Yousafzai has landed in Pakistan. he is getting married again? so you can sleep ? stop supporting the families who ruined us. how much are you getting from the destroyers of Pakistan. He is veritable and is true to his words. Imran speaks his mind and there is no double-dealing about him. He does not make false promises and backs up his words with deeds. His rally, gathering, assemblage must have been attended by at least a million strong supporters, maybe more. how many times you will support the culprits who have done nothing for except for building their own properties. please grow up and start thinking like a Pakistani not like a looter. Establishment has spent a lot on Imran Khan. He is just a puppet of Establishment. Pakistani public will succeed. Establishment will fail. PML-N will succeed. All puppets of Establishment like PTI, MQM, Tahir ul Qardi and Musharraf will fail. I believe that Imran Khan is the biggest enemy of Pakistan. He is providing maximum help to Zardari Tola. PPP will get much more seats due to present role being played by PTI on the signals of establishment. PTI supporters should use their mind if they have. Imran said that he would always speak truth. He can never speak truth. Thanks to ALMIGHTY ALLAH who showered rain and did not allow this liar to complete his speech. ALLAH bless Pakistan. Imran’s politics will harm Pakistan and will be beneficial for PPP. PTI supporters do not have mind. As Nawaz Shreef says, government complete 5 years due to PML N as has been supporting his corrupt government. Those who thinks Imran khan is supporting PPP should know that Nawaz has been doing this for five years and now taking all his corrupt politician, lotas, fake degrees every one in PML N.
PML N is the real support of PPP as they are just showing that they are against. I think no one should give vote to PML N because they already have 2 chances in national assembly and 5 chances in Punjab assembly. He does not have anything new, except some fake promises. All those who’re against IK. Just wait and see the next phase if IK does not come to power. Anyone who chooses the same old tried and tested politicians deserves to suffer then in my opinion. Thee is no competitor of Khan in Politics now. PTI will sweep in elections Insha ALLAH. Let me know i will thank you. All the best to Imran. IA I will fly back to the country to vote for him. I think a new party should be given chance to come to power and ofcorse let us pray they make a Nayarit Pakistan which every one wants. The call for a New Pakistan was first made by Zulfikar Ali Bhutto while he was speaking to the astounded nation on 20 December, 1971, after the fall of Dhaka due to a massive military defeat. It was an attempt to woo the people for whom the news of defeat came as a shocker amidst the amplified claims of military advancements and chants of foreseeing a victory through the mass media. Bhutto’s speech came as a reality check, his personal charisma, spellbinding oratory skills and the overwhelming mass support helped in convalescing a traumatised people. Bhutto’s attainment and shortcomings are a subject of debate for the past four decades but his populist politics, his tactics and antics have enthralled many, even among his detractors, and the catchwords are still taken over by even those on the opposite of political divide.